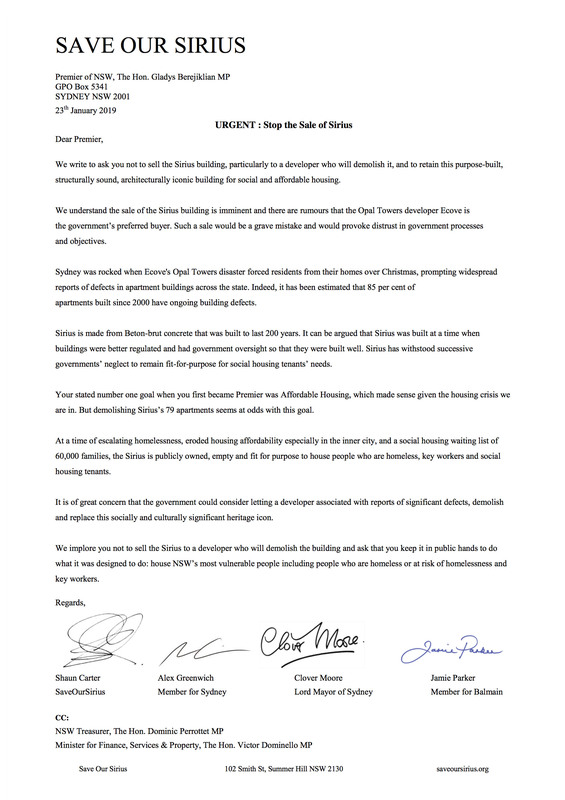 Yesterday, Save Our Sirius sent an open letter (see below) to the NSW Premier Gladys Berejiklian urging her to stop the sale and demolition of Sirius. The letter was signed by SOS Chair Shaun Carter, Member for Sydney Alex Greenwich, Sydney Lord Mayor Clover Moore, and Member for Balmain Jamie Parker. Rumours are the Governments preferred buyers is Ecove, the developer behind the Opal Tower in Homebush. ← Who supports Sirius heritage listing?